Cydia alternatives are coming at us from all directions now. One such alternative that has been released and is proving incredibly popular is called TweakBox App. TweakBox for Windows and Mac Available? Yes, it’s available. 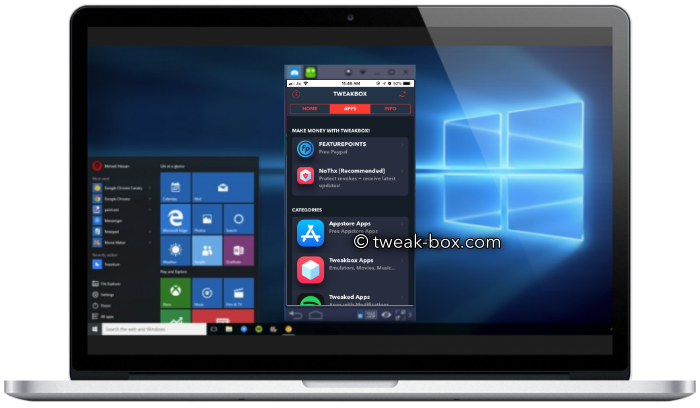 TweakBox is an unofficial app store that competes with the Windows and Mac appstore in terms of what it offers. You can download thousands of different apps, games. The most significant difference between this and the official store is that everything in TweakBox is “FREE” and much of it is modified or tweaked content; stock apps with additional features, stock games that are “Fully Unlocked” and so on. Now you can also use it on your Windows PC and Mac computer, and we’re going to show you just how easy it is. Download BlueStacks Android emulator to your computer and install it. Once TweakBox has been successfully installed, you will see the app icon on the home page in BlueStacks. Just click the icon and start using the installer. If you opt for Nox Player instead, simply download it and then follow the above instructions – it will work just the same. It really doesn’t matter what emulator you use, they both work the same, and they both provide you with access to all the apps and games and other content in TweakBox, right there on your PC, giving you the option of a much larger screen, great for some of those games. Using it really is very simple; click the icon on the home screen of your Android emulator, and the installer will open. Browser through, find what you want and click to download it to your PC. Are you going to try TweakBox on your PC? You should; it’s free, and it opens up a whole new world of content for you. Do let us know what you think of it and use the comments box below to report any issues you have with the download; we’ll do our best to find the solution for you. Follow us on Facebook for more useful app recommendations and other news.